On October 15-16, 2009, the Cathedral was blessed by the visit of the the miraculous Icon of the Mother of God "Softener of Evil Hearts". Hundreds of faithful Orthodox Christians of the greater Cleveland area venerated this holy Icon throughout the services on these days. Bishop Peter of Cleveland presided at the Akathist to the Mother of God before the Icon, during which he gave a sermon on the Orthodox veneration of the Mother of God and her intercession before her Son on behalf of those who pray to her. The Divine Liturgy, attended by many who could not attend the evening services, had the feeling of a Great Feast. The Cathedral choir sang splendidly and a multitude of worshipers prayed and partook of Holy Communion in the presence of the Icon. It is interesting to note that the travels of this Icon in the United States began at St. Sergius Church in the Synod building in New York, and ended at our St. Sergius Cathedral. 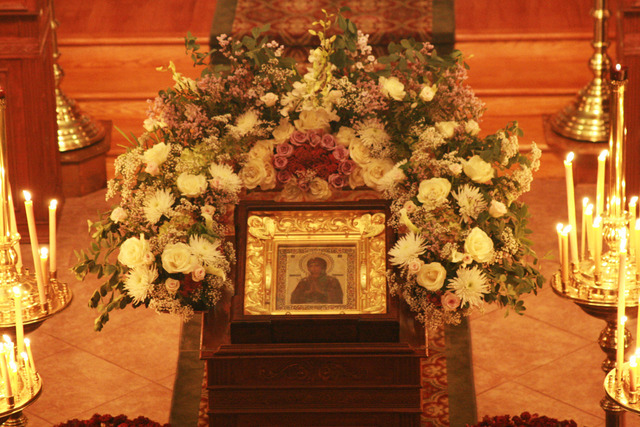 The Icon was not scheduled to come to the Cathedral, but by the grace of God, it was seen fit that she complete her journey here, bestowing a great blessing upon the St. Sergius Cathedral community and the Orthodox Faithful of the greater Cleveland area.